Charlie Gould seemed destined for adventure in his life. The young lad scarcely made it safe through his toddler years before his heroic deeds in front of Petersburg at the end of the war caused many to declare him the first Union soldier to reach the Confederate fortifications. While just two years old, he and his family visited his grandparents’ house in Windham, Vermont. While the adults talked, young Charlie became infatuated with the tantalizing smell wafting from a boiling pot of applesauce. He crawled over to the cauldron and steadied himself to bend over for an up close smell. While carefully balancing above the pot Charlie lost his balance and tumbled in, terribly scalding his legs. He was unable to walk until after his sixth birthday. But his enthusiasm for dangerous deeds remained. Local residents recalled the boy’s daredevil ways continued while he grew up. When the war began, Charlie’s parents wished their child would remain home. Gould was set to become a soldier and walked twenty miles to Bellows Falls to sign up. in August 1862. There Charles Gilbert Gould may have fibbed his age to gain entrance into the army. Some records, including his headstone, show Charlie’s birth occurring on May 5, 1845. Others show May 5, 1844, which would place him right at the age of 18 for his enlistment. Charlie joined the 1st Vermont Heavy Artillery as a private before swiftly rising up the ranks. 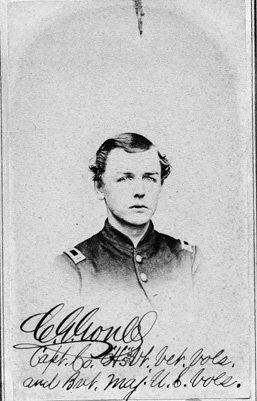 Upon his promotion to captain in late 1864, Gould was assigned to command of Company H, 5th Vermont Infantry. 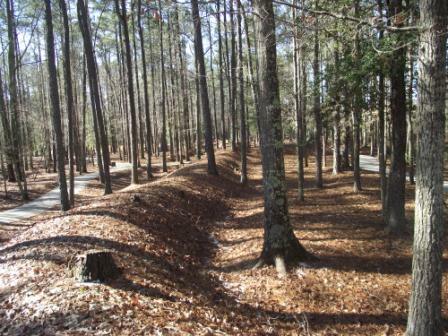 On April 2, 1865, that unit would serve as the spearhead for the entire VI Corps attack against the Confederate line along the Boydton Plank Road. That morning the regiment used a branch of Arthur’s Swamp to guide their way toward the Confederate earthworks in the darkness. As the Vermonters drew close to the wall, some of the men behind Gould began to drift to the right. Someone in the rear shouted “Bear to the left” to realign the wayward advance. The captain misinterpreted that suggestion as his direct order and led his company to the left across Arthur’s Swamp where they found themselves separate from the brigade and now out in front of Col. Joseph Warren Keifer’s brigade, who might confuse them for the enemy. Despite only having a handful of officers and just fifty men, Gould pressed forward to capture a makeshift battery that had been rolled into position to cover an opening in the Confederate earthworks. With fully healed legs from his applesauce tumble as a toddler, the youthful lad outran his company. He found a soft spot in the last line of abatis while his company’s pace was slowed as they filed through a narrow gap in the obstructions. Unaware that his men were no longer at his heels, Gould jumped into the ditch at the base of the enemy works and quickly scrambled up the parapet. The regiment was charging a fort, and as they were delayed a moment getting through the abatis, these officers rushed ahead without looking back to see whether the men were following. Capt. Gould rushed into the fort all alone, with nothing but his sword. The rebels came at him with swords, bayonets and clubbed muskets. One bayonet was thrust into his mouth and through his cheek, and while in that position he killed the man with his sword. An officer struck him on the head with a sword, and he was struck in the shoulder by a bayonet and pounded all over with clubbed muskets; but he gave as good as he got, until a corporal rushed in and pulled him out. Corporal Henry Recor received credit for hauling the officer’s body back into the ditch while Sergeant Jackson Sargent had rushed forward to plant the state colors on the works. Spurred by the shouts of their commander and the sight of their flag on the wall, more Green Mountain Men hurried forward to the top of the parapet. A brief, but desperate struggle was all it took to establish a foothold on the works as the North Carolina defenders threw down their muskets and surrendered or turn and ran as the bluecoats piled over en masse. Miraculously the captain regained his consciousness and stumbled the full mile back to the Union works where he asked for reinforcements to support his storming party. After receiving a guarantee that help was on the way for his men, Charlie then asked for some medical assistance for himself. My appearance upon the parapet was met with a leveled musket, which fortunately missed fire. I immediately jumped into the work, and my part in the engagement was soon over. I was scarcely inside before a bayonet was thrust through my face and a sword-thrust returned for it that fully repaid the wound given me, as I was subsequently informed that it killed my assailant. At almost the same breath an officer—or some one armed with a sword— gave me a severe cut in the head. The remainder of my brief stay in the work was a confused scramble, from which, had my assailants been fewer in number, I should scarcely have escaped. As it was, firing on their part would have been dangerous for their own men; consequently their efforts were apparently restricted to the use of bayonets and clubbed muskets. During the struggle I was once seized and my overcoat partially pulled off, and probably at this time another bayonet wound was given me in the back, as the bayonet passed through my inner coat between the shoulders, while my overcoat remained intact. This was the most severe wound of the three, the bayonet entering the spine and penetrating it nearly to the spinal cord. I have no distinct recollection of what followed, until I found myself at the parapet, trying to climb out of the work, but unable to do so. At this time Private Henry H. Recor, Company A., Fifth Vermont, appeared upon the parapet at that point. The brave fellow recognized the situation, and notwithstanding the danger incurred in doing so, pulled me upon the parapet, receiving a gunshot wound himself while saving me. 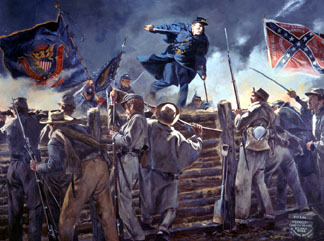 This terminated my part in the assault upon the lines at Petersburg. I must have been assisted out of the ditch without being recognized, as those with me were not aware of my escape, and I made my way to the rear as far as my remaining strength would carry me. Some of this journey is a blank to me. After an early life full of adventure Charlie decided to settle down for a more quiet life as a clerk in the pension and then patent offices. This entry was posted in Battlefields & Historic Places, Battles, Sesquicentennial, Sieges and tagged Breakthrough at Petersburg, Captain Charles Gould, Medal of Honor, Pamplin Historical Park, Siege of Petersburg, Vermont Brigade. Bookmark the permalink. Great article! Always seems like the 6th Corps were called upon for these tough assaults; Second Fredericksburg, Rappahannock Station, Dole’s Salient, “The Breakthrough”. On the Confederate side it’s almost fitting that the brigade they smashed through was Lane’s North Carolinian’s. Those poor guys seemed to show up in some of the worst positions on the Confederate line; Fredericksburg, Chancellorsville (shooting Jackson and Lane having a mental breakdown), Wilderness, “The Breakthrough”; then Lane essentially leaving Harris’ men for dead at Fort Gregg. Thanks for sharing Charlie’s story, great stuff!! Congrats on the new books as well! Read the account of this soldiers amazing courage then take a knee during the national anthem and put your ignorance on display. This man is not alone in displaying unimaginable courage under fire to insure your freedom to act like ungrateful 2 year old. Do yourself a favor and read a history book for once in your life. I would also argue that Sgt. 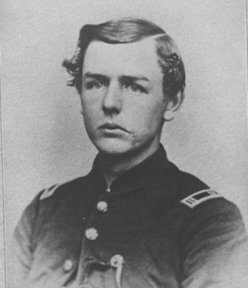 Buffington of the 6th MD was among the first across the works. Not sure about the timing between him and Gould but Buffington would receive the MOH for his bravery and I believe he also recieved a cash bonus. 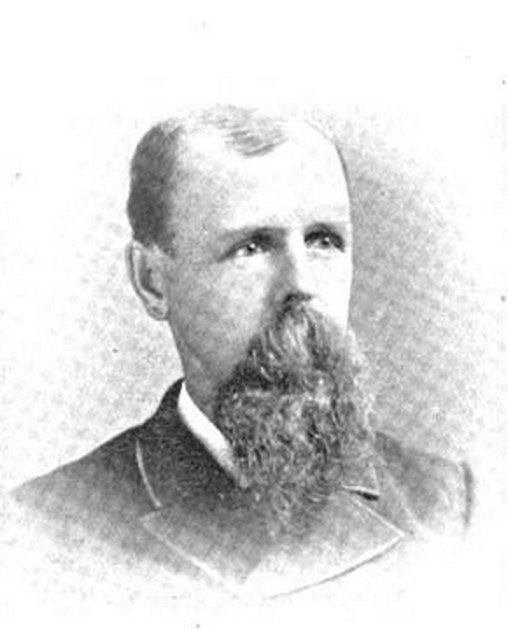 John Buffington was definitely among the first and most likely the first from the Third Division to reach the works. They were en echelon to the left of the Vermont Brigade so he would definitely have to outpace Gould to beat him, but in the frantic darkness that morning it would be impossible to truly tell. Truman Seymour, commanding the Third Division, forwarded Buffington’s name for the cash reward that U.S. Grant offered (from an anonymous donor). Sixth Corps commander Horatio Wright selected Sergeant David W. Young, 139th Pennsylvania instead – more on Young here: https://emergingcivilwar.com/2018/03/14/stolen-pie-but-a-bigger-prize-for-sergeant-young-at-petersburg/. Buffington did finally receive a medal in 1908. He definitely earned the Medal of Honor, whether he was first or not. The veterans did think it was relevant, however, arguing on the pages of the National Tribune and likely at reunions and ceremonies. In 1904, Gould even attempted to have the War Department change his Medal citation to say he was definitively the first. I have more on that coming up in an article next week.